Protect your family against mosquitoes using Bodyguard's Fabric Roll on which is a 100% herbal and natural mosquito repellent. 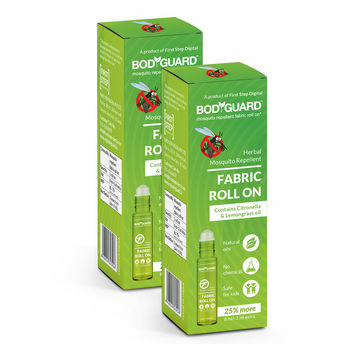 Made using natural ingredients like citronella and lemongrass oil, this fabric roll on keeps mosquitoes away. Additional Information: First Step Digital Private Limited is a Delhi-based startup known for their Personal Hygiene and Intimate Care category products.Focused mainly on solving personal care, hygiene concerns faced by female population in India, the company has been involved in introducing unique, innovative products in the women's health and hygiene space along with taking care of wellness needs of Indian customers.The company has various product lines, right from one-of-its kind female urination device- PeeBuddy (India's First), feminine pain-relief patches, biodegradable sanitary disposal bags, underarm sweat pads, to natural mosquito patches and bands. Explore the entire range of Mosquito Repellent available on Nykaa. Shop more Bodyguard products here.You can browse through the complete world of Bodyguard Mosquito Repellent .